There are three methods used to check for DTCs. 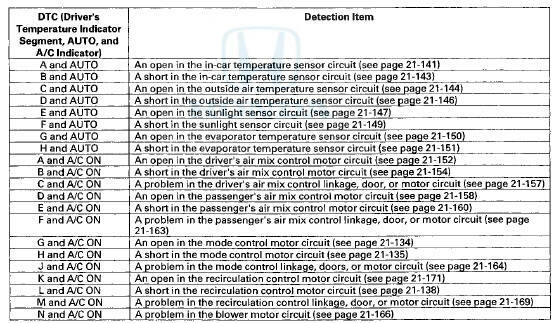 The recommended method is to use the Honda Diagnostic System (HDS) with the appropriate software, plugged into the data link connector (DLC). The second method is to run the self-diagnostic function built into the climate control unit. The third method is to use the B-CAN system diagnostic test mode A (see page 22-134). 1. Make sure the ignition switch to LOCK (0). 2. Connect the HDS to the data link connector (DLC) (A) located under the driver's side of the dashboard. 4. Make sure the HDS communicates with the vehicle and the climate control unit. If it doesn't, troubleshoot the DLC circuit (see page 11-181). 5. Select HVAC/CLIMATE CONTROL in the BODY ELECTRICAL menu. 6. Select DTCs in the HVAC/CLIMATE CONTROL menu. 7. Check for DTCs. If any DTCs are indicated, write down the DTCs, then go to the indicated DTC troubleshooting. If no DTCs are indicated, refer to symptom troubleshooting. NOTE: вЂў After troubleshooting, clear the DTCs with the HDS. вЂў For specific operations, refer to the user's manual that came with the HDS. 2. Connect the HDS to the data link connector (DLC). 6. Select INSPECTION in the HVAC/CLIMATE CONTROL menu. 7. Select CLIMATE CONTROL SELF TEST in the INSPECTION menu. 8. Check lor DTCs. If any DTCs are indicated, write down the DTCs, then go to the indicated DTC troubleshooting. 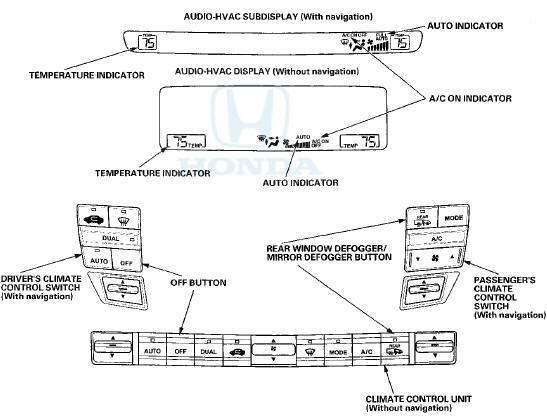 The climate control unit has a self-diagnostic function. To run the self-diagnostic function, do the following: 1, Turn the ignition switch to LOCK (0), and then to ON (II). 2. Press and hold the OFF button, then within 10 seconds press and release the REAR WINDOW DEFOGGER/MIRROR DEFOGGER button five times. Release the OFF button; then the self-diagnostic begins. NOTE: вЂў The blower motor will run at various speeds regardless of what the panel is displaying. вЂў If there is a problem with the system, the temperature indicator flashes 88, and the A/C ON indicator or the AUTO indicator (or both) also flashes. Segments in the temperature indicator then indicate which DTCs are present. вЂў If there is more than one DTC, they are displayed one at a time in sequence followed by a pause (all the display indicator segments illuminate) between the DTCs. вЂў If there are no problems detected, the segments will not illuminate, and the system will appear to be turned off. The temperature display indicates single or multiple DTCs. If no DTCs are present, the indicator remains blank. The climate control unit has a mode that displays sensor inputs it receives. This mode shows you what the climate control unit is receiving from each of the sensors, one at a time, and it can help you determine if a sensor is faulty. 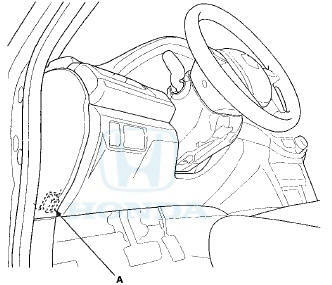 1 _ Turn the ignition switch to ON (II), and check the recirculation door function; press the recirculation button to switch from FRESH to RECIRC. The air volume and sound should change slightly. 2. Set the temperature using the driver's control switch to the desired test temperature: вЂў Press AUTO button on, the LED turns on. вЂў '08-09 models; Press DUAL button off, the LED turns off. вЂў '10 model; Press SYNC button off, the LED turns off. When selecting the test temperature, note these items: вЂў "Lo" temperature setting will default to MAX COOL, VENT, and RECIRC. вЂў "Hi" temperature setting will default to MAX HOT, FLOOR, and FRESH. вЂў 58 through 86 В°F settings will use the automatic climate control logic. 2. Press and hold both the AUTO and RECIRCULATION CONTROL buttons, then start the engine. 3. After the engine starts, release both buttons. The audio-HVAC display will flash the sensor number, and then the value for that sensor. Record the value displayed. 4. To advance to the next sensor, press the REAR WINDOW DEFOGGER button. NOTE: вЂў The sensor values will be displayed in degrees Celsius (В°C) or an alphanumeric code. 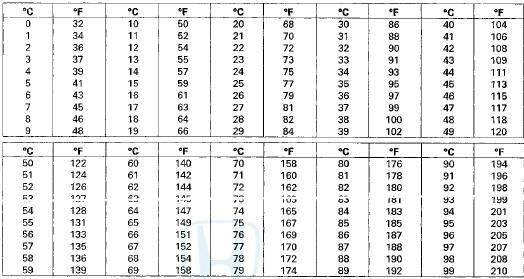 Use the chart to convert the value to degrees Fahrenheit (В°F). вЂў If the sensor value displays "Er" this indicates there is an open or short in the circuit or sensor. 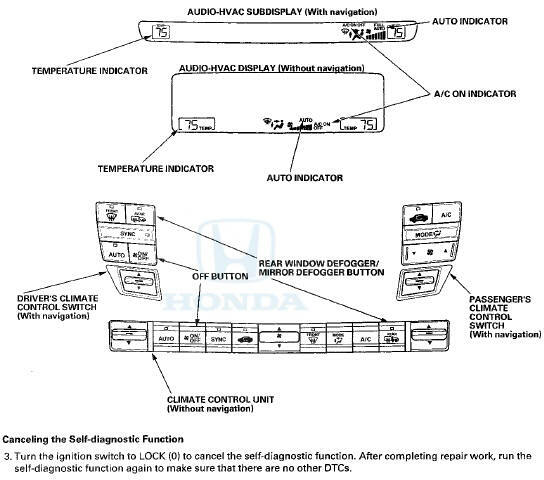 Check for DTCs using the HDS, or use the climate control self-diagnostic function. вЂў If necessary, compare the sensor input display to a known-good vehicle under the same test conditions. вЂў If the sensor is out of the normal range, refer to the sensor test or substitute a known-good sensor, and recheck. 5. To cancel the sensor input display mode, press the AUTO button or turn the ignition switch to LOCK (0).